Elections have consequences. They decide who holds power and therefore the laws that we live under. But they also reflect principles of federalism and consent of the governed, as well as the complexity of the American system. They can be moments of high drama and low farce. Some candidates can inspire their fellow Americans while others make people wonder what could ever recommend them for public office. Shockingly, candidates in the latter category sometimes win. Because of the drama of electoral combat between two opponents, we tend to neglect factors that structure how campaigns are organized and operate. We also often forget that the campaign is only a precursor to the more important task of governing. But campaigns can often constrain how officers will govern—and not always in ways that are desirable. Perhaps the most perplexing institution of American politics is the Electoral College. Instead of being elected by the people, presidents are officially elected by members of the Electoral College. Today that means that when you vote for a presidential candidate you are actually voting for a slate of electors from that candidate’s party. Two troublesome results are possible with this system. The first is that the winner of the Electoral College does not have to win the popular vote, which happened in three presidential elections: 1876, 1888, and 2000. This appears antithetical to democratic principles of political equality. If we are equals, then our votes should be equal and the person who secures the most votes should win. In response, defenders of the Electoral College point out that a contest conducted under the Electoral College does not indicate what the popular vote would have been under a pure national popular vote. The campaigns base their strategy on the rules of the system. Thus candidates try to increase their vote total in key, closely contested states rather than just trying to increase their overall vote tally. Just as gaining the most yards in a football game does not guarantee a victory, receiving the most votes does not guarantee victory in a presidential election. The reason for this potentially anti-majoritarian result is the federal nature of the Electoral College. Votes in the Electoral College are allocated based on a state’s total representation in Congress. This apportionment means that each state gets one elector for each Representative and Senator. Since each state has two Senators regardless of population, less populous states have a disproportionate influence. This effect is exaggerated by the fact that all but two states allocate their Electoral College votes on a winner-take-all principle. Hence, someone could win 50.1 percent of a state’s votes in the popular election but would receive all of the state’s votes in the Electoral College. A second potentially troublesome possibility is that members of the Electoral College can vote for anyone. Under the Constitution they are free to cast their ballot as they wish. State parties do have their slates of electors pledge to vote their party’s candidate but that pledge cannot be legally binding upon the member of the Electoral College. Some electors can be and occasionally are “faithless electors” who do not vote for their party’s candidates. In a close race such an elector or electors could end up being decisive allowing one or few electors’ judgment to supplant the will of a majority of voters. However, faithless electors have been very rare in American history. And one can imagine a variety of scenarios where their discretion could prove useful. Defenders of the Electoral College point out that despite these problems the system has compensating virtues. Or as Alexander Hamilton said in Federalist No. 68, the Electoral College is “not perfect,” but “it is at least excellent” (Alexander Hamilton, Federalist No. 68, 1788). Under the Electoral College candidates are forced to build a larger geographic base of support. They cannot expect to win and only be popular in a particular state or region. Forcing candidates to have a broader appeal, the founders hoped, would also reduce the possibility that a demagogues could win the presidency. Part of what made the Electoral College excellent, Hamilton argued, was that “talents for low intrigue, and the little arts of popularity, may alone suffice to elevate a man to the first honors in a single State; but it will require other talents, and a different kind of merit, to establish him in the esteem and confidence of the whole Union.” Since the Constitution establishes a compound republic, the Electoral College reinforces the importance of states as well. The primary alternative to the Electoral College, a popular national vote, invites the risk of lengthy and traumatic disputes in close elections. With the Electoral College, recounts are confined to individual closely contested states. With a pure national election, narrow elections would require recounting ballots across the entire nation with interminable battles over how ballots should be recounted and what standards should be used to evaluate contested ballots. While the Electoral College is the most controversial feature of our electoral system, perhaps the most important feature is the nomination system. Millions of Americans are constitutionally eligible to be president, but the nomination system winnows that number down to the two candidates from the major parties. How they select their nominees shapes the type of person who will get elected and how that person will govern. Initially parties controlled the nomination process through a convention system. Party regulars would select their party’s candidate at a national convention. But during the twentieth century the parties moved to a primary system where nominees seek the nomination in popular primaries and caucuses. This allowed candidates to “self-select” and choose to run on their own rather than being called by the party. Because of this change, potential presidential candidates are engaged in a “continuous campaign” and begin organizing their campaigns and raising money years before the general election. The danger of this system is that campaign politics will intrude into the ordinary process of governing. Presidential candidates who currently hold another office will often base their decisions not what is best for the country but what will maximize their chances of winning their party’s nomination. 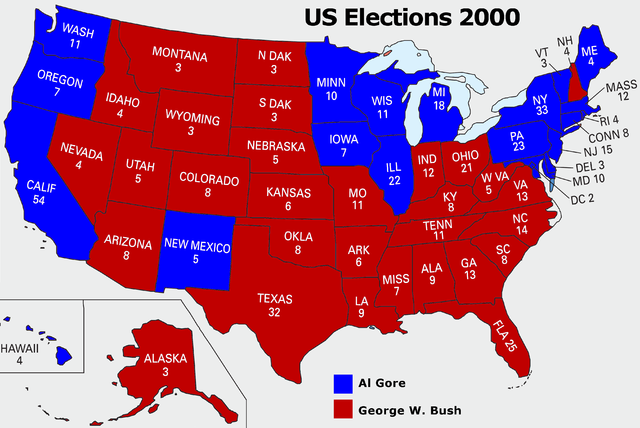 In the 2000 presidential election, Al Gore won the popular vote but lost the Electoral College vote. While presidential elections receive the most attention, congressional elections are also important means express popular sovereignty and the principles of federalism. The Constitution’s system of separation of powers requires the House and Senate to each have an independent electoral base, which allows members of each chamber to exercise independent authority. Members of Congress are meant to resist the demands and entreaties of presidents and their method of selection reflects this intention. In the House of Representatives, Representatives’ first object of loyalty is their constituents. Members of the Senate are meant to prioritize the best interest of the state over the popular will. However, with the Seventeenth Amendment, which changed the method of selection of Senators from appointment by the state legislature to popular elections, the Senate’s function as a “cooling saucer” for popular passions has somewhat diminished and is now more likely to reflect the immediate popular will. Members of the House of Representatives and the Senate also have different terms that also shape Congressional elections. Senators have six-year terms and staggered elections, which lends stability and deliberateness to the institution whereas members of the House have two-year terms. While presidents are limited to two terms, members of Congress can be reelected indefinitely. As incumbents, officials already holding office, they have significant advantages, such as name recognition, over challengers. Because its members face reelection every two years, one would expect the House to experience substantially higher turnover to the Senate. But the power of incumbency combined with gerrymandering mean that incumbents are reelected nearly 90 percent of the time. Gerrymandering is the process of drawing legislative districts for partisan advantage. Redistricting occurs every ten years after each census. In state legislatures, which usually control the redistricting process, members of both the Democratic and Republic parties often work to protect their own party’s incumbents from challengers making redistricting an “incumbency protection act”. Hence, they try to protect Democrats from Republicans and vice versa. This has led to the rise of safe seats where the general election is a mere formality and opposition candidates and have little chance to win. In 2012, for example, 85 percent of all house races were won with over 55 percent of the vote and 66 percent were won with over 60 percent of the vote. One cause of increased gerrymandering were Supreme Court rulings in Wesberry v. Sanders (1964) and Reynolds v. Sims (1964) which required all districts in the House of Representatives and state legislatures to follow the principle of “one man, one vote,” which required equal populations in legislative districts. This principle precluded state legislatures from drawing district lines along geographic or county lines and encouraged them to draw district lines for political advantage. 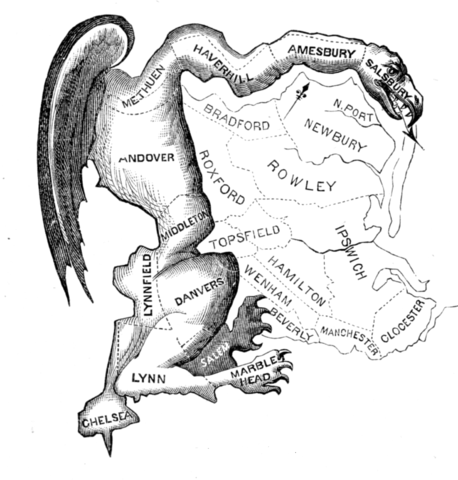 This early political cartoon criticized the use of gerrymandering in the new nation. While the Electoral College and gerrymandering are controversial, another complaint about American campaigns and elections is the role of money. Two distinct questions are often raised: does money buy elections and do campaign finance regulations infringe on freedom of speech? Complaints about the baleful influence of money are common. The underlying assumption is that those who can spend more, win more. But there are reasons to doubt that money buys elections. In addition to incumbency and gerrymandering, which often guarantee that no amount of money would allow an insurgent candidate to win, other factors such as the performance of the economy play a more significant role in determining electoral outcomes than campaign spending. The amount of money a candidate raises is sometimes an indication of their attractiveness as a candidate. A good candidate is then responsible both for the money they raise and the votes they receive. The second question raises more fundamental constitutional concerns. In response to fears about the potentially corrupting influence of money on elections, Congress began enacting restrictions on how much individuals could give to political candidates and to political parties in 1971. But limiting the ability of individuals and parties to raise money also limits their ability to spread their political message. While money is not speech it does enable speech. And if you put impediments in the way of speaking you obstruct the ability of individuals to exercise their First Amendment rights. In the same way flying is not speech but does enable speech. If the government restricted how much you could fly during a campaign, you would certainly contend that your right to freedom of speech had been unconstitutionally impeded. The Supreme Court has been repeatedly called upon to decide the constitutionality of these regulations. In general, the Court has upheld restrictions on donations but struck down attempts to limit how much candidates could spend. Regardless of the constitutionality of campaign finance regulation, two of its obvious effects have been to increase the amount of time candidates have to devote to fundraising and to increase the power of incumbency. Limiting the amount of individual donations means that candidates have to spend more time securing individual donations. This in turn makes it appear that political candidates are only interested in raising money. Since incumbency bequeaths huge advantages, insurgent candidates have to acquire much larger war chests to be competitive. But campaign finance laws limit their ability raise sufficient money to conduct viable campaigns. More recently, in 1964 in the most famous presidential television campaign advertisement, the “Daisy Spot,” with a nuclear explosion on screen Lyndon Johnson said "These are the stakes: to make a world in which all of God's children can live, or to go into the dark. We must either love each other, or we must die" (Lyndon Johnson Presidential Campaign, “Daisy Girl,” 1964). A vote for his opponent, Barry Goldwater, was all but a vote for nuclear war. What counts as a negative ad is often in the eye of the beholder. One candidate’s negative ad is another’s factual presentation of his opponent’s record. Analysis of negative ads by political scientists has shown that negative ads contain far more information than positive ones. Hence, negative ads do more to help inform the public about where candidates actually stand on important issues than positive ads. While negative ads can certainly lie and mislead, positive ads tend to focus on gauzy but unimportant aspects of a person’s fitness for office. Seeing candidates smiling with their spouses and children might warm the hearts of voters, but these sorts of ads do not provide any information about the principles or abilities of office seekers. It is far more important for voters to be able to gauge a candidate’s political philosophy and capacity to be an affective political leader. While exaggerated, concerns about campaign finance and negative campaigning do help remind us of the importance of elections to our political system. Elections channel public sentiment and reinforce the principle of self-government. Concerns about the legitimacy of elections should be taken seriously. But ultimately elections point to our responsibility as citizens to exercise our right vote thoughtfully. There is no perfect political world where candidates refrain from attacking their opponents or where campaigning does not cost money. If citizens cannot critically evaluate the merits of candidates and can be manipulated with emotional appeals financed by campaign war chests, then there is little reason to trust voters at all. The Framers of the Constitution, however, believed that a system based on the consent of the governed was not only possible but also necessary for a free society to function. Our duty is to prove that their faith was not misplaced.